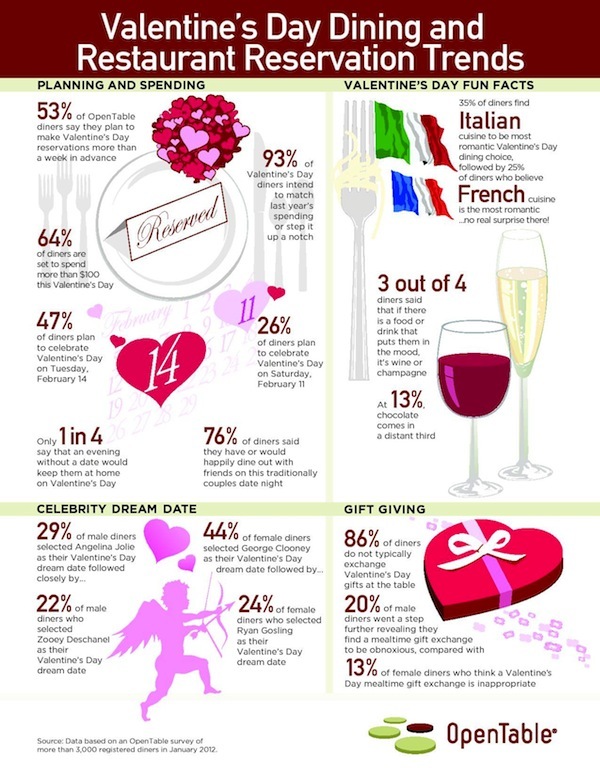 As Cupid prepares to pull back his bow on February 14th, OpenTable has surveyed our network of diners to find out how and when you’re planning to celebrate Valentine’s Day, which celebs you’d most like to dine with, and what types of foods put you in the mood. Get all the details in our fun infographic below! 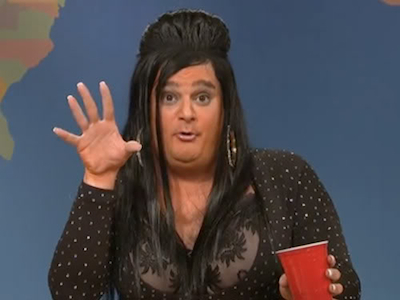 We're hoping Snookie left her signature red cup at home when she dined out with her beau. 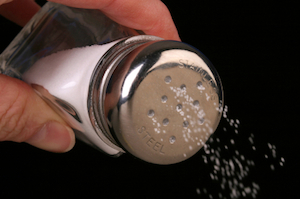 Dining Poll: Should You Have to Ask Your Server to Pass the Salt? Unfortunately for Angelina Jolie, the movie 'Salt' didn't prove nearly as popular as the mineral form that's often -- but not always -- found on dining tables. You can probably divide the world of diners into two groups — those who consider a salt shaker or a small dish of kosher salt as important as a fork and those who rarely salt their food. I’m not as addicted to salt as, say, my friend Michele (who often salts before tasting, a practice that drives me absolutely batty! ), but I’ve been known to salt my steak (and my bread, too, which sounds weird but is actually really tasty!). When I’ve had to ask for salt at a restaurant, the assumption on the part of several servers has been that there’s — Gasp! — something wrong with the food (No, just my palate, thankyouverymuch.). I wonder, then, should salt automatically be served to avoid such exchanges — or not? At a certain level of restaurant, is it wrong to ask for salt? What do you think? Take our poll and weigh in! 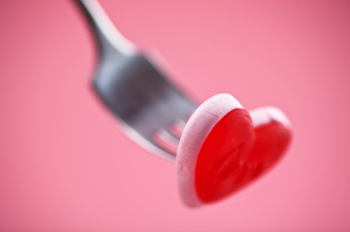 Valentine’s Day 2010: Put a Fork in It! Valentine’s Day 2010 is just a fond (I hope!) memory by now. I hope yours was as fun as mine (I dined at SHO Shaun Hergatt and had a delightful Valentine’s Day dinner!). I didn’t get there in a limo, but some lucky Tweeps had that option, thanks to winning the OpenTable Valentine’s Day Limo Twitter Giveaway, sponsored by Limos.com. Congratulations to all our winners! One of the most popular eateries for Valentine’s Day, according to your tweets in response to Monday’s query, was — surprise! — The Melting Pot. On Tuesday, when we asked who your celebrity dream date is, the most popular celebs were actors Halle Berry and Tyrese. Sandra Bullock and Ryan Reynolds took second place. Angelina Jolie may have Brad Pitt, but more of you want to dine with his first wife, Jennifer Aniston. The “Jersey Shore” cast proved popular, with JWoww, The Situation, and DJ Pauly D getting some love from OpenTable diners (but not, alas, Snookie. Poor Snickers!) Your most random dream dates? “Golden Girl” Bea Arthur and hockey great Gordie Howe. Someone chose reality-TV-star-turned-punchline Jon Gosselin. Let’s hope it was in jest. When we asked you to tweet your favorite romantic movie on Thursday, Love Actually was the winner — but just by one vote. The Notebook came in second. Other picks included Casablanca, Ghost, Sleepless in Seattle, When Harry Met Sally, and The Princess Bride. Offbeat tweets highlighted Better Off Dead, The Empire Strikes Back, and Shaun of the Dead (Nothing says romance like zombies, really.). Cutest tweets: Lady and the Tramp got two votes. That pasta-sharing scene gets me every time I see it, and, clearly, I’m not alone. It also makes me want to eat spaghetti every time I see it. Finally, the most romantic city, according to your tweets, is — shocker! — Paris. New York bumped San Francisco to third place, by just a single tweet. Florence and Venice, Italy, each got a lot of love as did Charleston. Unique suggestions included Bruges, Pittsburgh, and Warsaw. Congratulations again to our winners, and thanks to Limos.com and for all your terrific tweets. If you’re still seeking more romance until next Valentine’s Day, check out the Top 50 Most Romantic Restaurants, according to the 2010 OpenTable Diners’ Choice Awards.